The Order of Brothers of the German House of Saint Mary in Jerusalem (official names: Latin: Ordo domus Sanctæ Mariæ Theutonicorum Hierosolymitanorum, German: Orden der Brüder vom Deutschen Haus der Heiligen Maria in Jerusalem), commonly the Teutonic Order (Deutscher Orden, Deutschherrenorden or Deutschritterorden), is a Catholic religious order founded as a military order c. 1190 in Acre, Kingdom of Jerusalem. Purely religious since 1929, it still confers limited honorary knighthoods. The order was formed to aid Christians on their pilgrimages to the Holy Land and to establish hospitals. Its members have commonly been known as the Teutonic Knights, having a small voluntary and mercenary military membership, serving as a crusading military order for protection of Christians in the Holy Land and the Baltics during the Middle Ages. Formed in the year 1190 in Acre, in the Levant, the medieval Order played an important role in Outremer, controlling the port tolls of Acre. After Christian forces were defeated in the Middle East, the Order moved to Transylvania in 1211 to help defend the South-Eastern borders of the Kingdom of Hungary against the Kipchaks. The Knights were expelled by force of arms by King Andrew II of Hungary in 1225, after attempting to place themselves under papal instead of the original Hungarian sovereignty and thus to become independent. 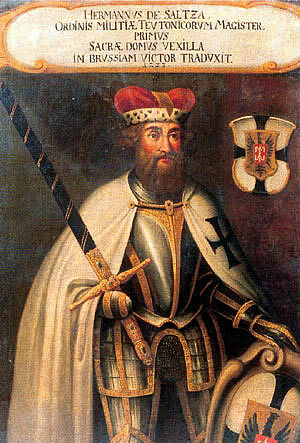 In 1211, Andrew II of the Hungary accepted the services of the Teutonic Knights and granted them the district of Burzenland in Transylvania. Andrew had been involved in negotiations for the marriage of his daughter with the son of Hermann, Landgrave of Thuringia, whose vassals included the family of Hermann von Salza. Led by a brother called Theoderich, the Order defended the South-Eastern borders of the Kingdom of Hungary against the neighbouring Cumans. 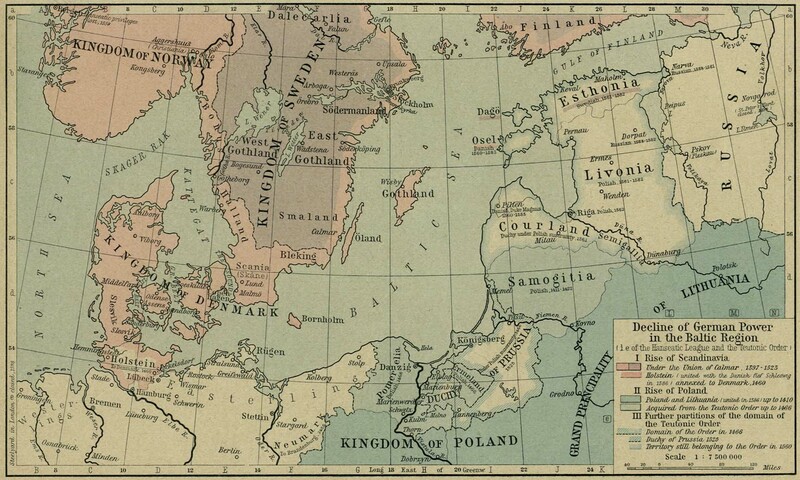 They settled new Germans among the existing inhabitants, who were known as the Transylvanian Saxons. 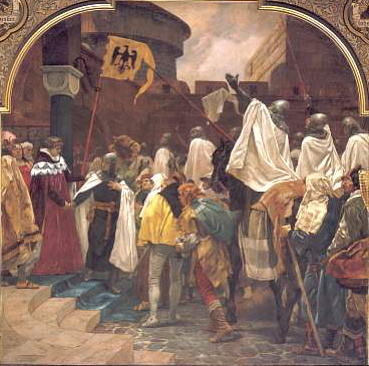 In 1224, the Knights petitioned Pope Honorius III to be placed directly under the authority of the Papal See, rather than that of the King of Hungary. Angered and alarmed at their growing power, Andrew responded by expelling them in 1225, although he allowed the new arrivals to remain. In 1236 the Knights of Saint Thomas, an English order, adopted the rules of the Teutonic Order. A contingent of Teutonic Knights of indeterminate number is traditionally believed to have participated at the Battle of Legnica in 1241 against the Mongols. However, recent analysis of the 15th century Annals of Jan Długosz by Labuda suggests that the German crusaders may have been added to the text (listing the Allied Army) after the chronicler Długosz had completed the work. Legnica is the farthest west the Mongol expansion would reach in Poland. 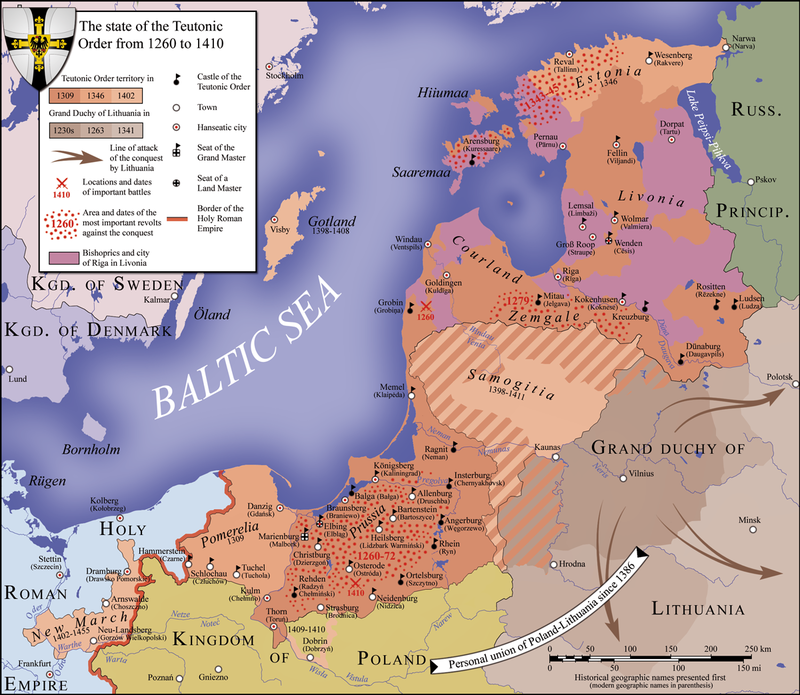 The Livonian Brothers of the Sword were absorbed by the Teutonic Knights in 1237, after the former had suffered a devastating defeat in the Battle of Saule. The Livonian branch subsequently became known as the Livonian Order. Attempts to expand into Kievan Rus failed when the knights suffered a major defeat in 1242 in the Battle of the Ice at the hands of Prince Alexander Nevsky of Novgorod. Over the next decades the Order focused on the subjugation of the Curonians and Semigallians. In 1260 it suffered a disastrous defeat in the Battle of Durbe against Samogitians , which inspired rebellions throughout Prussia and Livonia. After the Teutonic Knights won a crucial victory in the Siege of Königsberg from 1262 to 1265, the war had reached a turning point. The Curonians were finally subjugated in 1267 and the Semigallians in 1290. 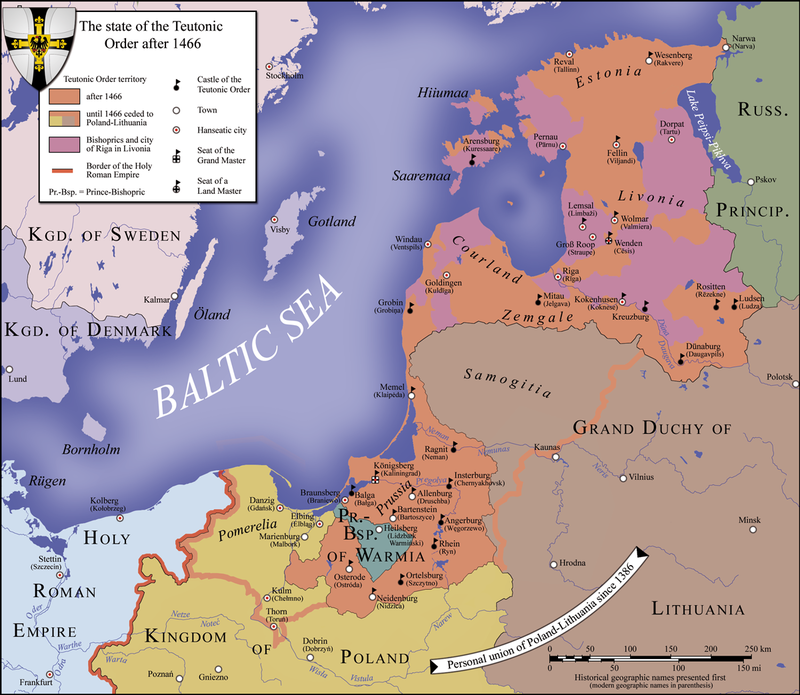 The Order suppressed a major Estonian rebellion in 1343-1345, and in 1346 purchased the Duchy of Estonia from Denmark. 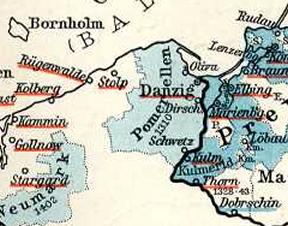 The Order gradually lost control of these holdings until, by 1810, only the bailiwicks in Tyrol and Austria remained. By the end of the 20th century, this part of the Order had developed into a charitable organization and incorporated numerous clinics, as well as sponsoring excavation and tourism projects in Israel. In 2000, the German chapter of the Teutonic Order declared bankruptcy and its upper management was dismissed; an investigation by a special committee of the Bavarian parliament in 2002 and 2003 to determine the cause was inconclusive. The Catholic branch now consists of approximately 1,000 members, including 100 Roman Catholic priests, 200 nuns, and 700 associates. While the priests are organized into six provinces (Austria, the Czech Republic, Germany, Italy, Slovakia, and Slovenia) and predominantly provide spiritual guidance, the nuns primarily care for the ill and the aged. Associates are active in Austria, Belgium, the Czech Republic, Germany, and Italy. Many of the priests care for German-speaking communities outside of Germany and Austria, especially in Italy and Slovenia; in this sense the Teutonic Order has returned to its 12th-century roots: the spiritual and physical care of Germans in foreign lands. The current General Abbot of the Order, who also holds the title of Grand Master, is Bruno Platter. The current seat of the Grand Master is the Deutschordenskirche (Church of the German Order) in Vienna. Near the Stephansdom in the Austrian capital is the Treasury of the Teutonic Order, which is open to the public, and the order's Central Archive. Since 1996, there has also been a museum dedicated to the Teutonic Knights at their former castle in Bad Mergentheim in Germany, which was the seat of the Grand Master from 1525–1809. Honorary Knights of the Teutonic Order include Otto von Habsburg, Konrad Adenauer and others. 14th century brass stamp with the shield insignia. A portion of the Order retains more of the character of the knights during the height of its power and prestige. The Balije van Utrecht ("Bailiwick of Utrecht") of the Ridderlijke Duitsche Orde ("Chivalric German [i.e., 'Teutonic'] Order") became Protestant at the Reformation, and it remained an aristocratic society. The relationship of the Bailiwick of Utrecht to the Roman Catholic Deutscher Orden resembles that of the Protestant Bailiwick of Brandenburg to the Roman Catholic Order of Malta: each is an authentic part of its original order, though differing from and smaller than the Roman Catholic branch. A German National People's Party poster from 1920 showing a Teutonic knight being attacked by Poles and socialists. The caption reads "Save the East". ^ "The Grand Masters". Teutonic Order, Order of the Teutonic Knights of St. Mary's Hospital in Jerusalem. http://www.deutscher-orden.de/GB/all_geschichte_hochmeister.php#. Retrieved 2011-01-30. "Abbot Dr. Bruno Platter 2000–"
^ Van Duren, Peter (1995). Orders of Knighthood and of Merit. C. Smythe. pp. 212. ISBN 0-86140-371-1. https://books.google.com/books?id=urBxAAAAMAAJ&q=%22Order+of+The+Teutonic+Knights+of+St.+Mary%27s+Hospital+in+Jerusalem%22&dq=%22Order+of+The+Teutonic+Knights+of+St.+Mary%27s+Hospital+in+Jerusalem%22&ei=8nwWSckclJQx6fWYww4&client=firefox-a&pgis=1. ^ Redazione. "La Santa Sede e gli Ordini Cavallereschi: doverosi chiarimenti (Seconda parte)". http://www.zenit.org/it/articles/la-santa-sede-e-gli-ordini-cavallereschi-doverosi-chiarimenti-seconda-parte. ^ "The Order of the Teutonic Knights of St. Mary's Hospital in Jerusalem - 1190-2017". ^ "History of the German Order". Teutonic Order, Order of the Teutonic Knights of St. Mary's Hospital in Jerusalem. http://www.deutscher-orden.de/GB/all_geschichte_start.php#aufstieg. Retrieved 2011-01-30. "The 15th and early 16th century brought hard times for the Order. Apart from the drastic power loss in the East as of 1466, the Hussite attacks imperilled the continued existence of the bailwick of Bohemia. In Southern Europe, the Order had to renounce important outposts – such as Apulia and Sicily. After the coup d’état of Albrecht von Brandenburg, the only territory of the Order remained were the bailwicks in the empire." ^ Sainty, Guy Stair. "The Teutonic Order of Holy Mary in Jerusalem". Almanach de la Cour. www.chivalricorders.org. http://www.chivalricorders.org/vatican/teutonic.htm. Retrieved 2011-01-30. "This tradition was further perverted by the Nazis who, after the occupation of Austria suppressed it by an act of 6 September 1938 because they suspected it of being a bastion of pro-Habsburg legitimism." ^ "Restart of the Brother Province in 1945". Teutonic Order, Order of the Teutonic Knights of St. Mary's Hospital in Jerusalem. deutscher-orden.de. http://www.deutscher-orden.de/GB/D_neubeginn.php. Retrieved 2011-01-30. ^ a b Demel, Bernhard (1999). Friedrich Vogel. ed. Der Deutsche Orden Einst Und Jetzt: Aufsätze Zu Seiner Mehr Als 800jahrigen Geschichte. 848. Frankfurt-am-Main, Germany: Peter Lang. pp. 80. ISBN 978-3-631-34999-1. ^ The Battle of Liegnitz (Legnica), 1241, AllEmpires.com. Accessed July 17, 2015. ^ Sainty, Guy Stair. "The Teutonic Order of Holy Mary in Jerusalem". Chivalric Orders. http://www.chivalricorders.org/vatican/teutonic.htm. Retrieved 6 June 2006. ^ Sainty, Guy Stair. "The Teutonic Order of Holy Mary in Jerusalem". Almanach de la Cour. www.chivalricorders.org. http://www.chivalricorders.org/vatican/teutonic.htm. Retrieved 2011-01-30. "[T]he nazis...after the occupation of Austria suppressed [the Order] by an act of 6 September 1938 because they suspected it of being a bastion of pro-Habsburg legitimism. On occupying Czechoslovakia the following year, it was also suppressed in Moravia although the hospitals and houses in Yugoslavia and south Tyrol were able to continue a tenuous existence. The Nazis, motivated by Himmler's fantasies of reviving a German military elite then attempted to establish their own "Teutonic Order" as the highest award of the Third Reich. The ten recipients of this included Reinhard Heydrich and several of the most notorious Nazi criminals. Needless to say, although its badge was modeled on that of the genuine Order, it had absolutely nothing in common with it." ^ Deutschordenskirche, Wien 1 – an explanatory pamphlet (in German) of the Order available in the Deutschordenskirche, by Franz R. Vorderwinkler, 1996, published by Kirche & Kultur Verlag mediapress, A-4400, Steyr. ^ a b (Polish) Mówią wieki. "Biała leganda czarnego krzyża". Accessed 6 June 2006. Selart, Anti (2015). Livonia, Rus’ and the Baltic Crusades in the Thirteenth Century. Leiden: Brill. pp. 400. ISBN 978-9-00-428474-6. Innes-Parker, Catherine (2013). Anchoritism in the Middle Ages: Texts and Traditions. Cardiff: University of Wales Press. pp. 256. ISBN 978-0-7083-2601-5. This page uses content from the English language Wikipedia. The original content was at Teutonic Order. The list of authors can be seen in the page history. As with this Familypedia wiki, the content of Wikipedia is available under the Creative Commons License.